This image of asteroid 2005 YU55 was captured on the night of Nov. 8, 2011, by the 25-inch telescope at the Clay Center Observatory in Brookline, Mass. The asteroid is the bright white dot near left-center; the white streaks are stars, which appear to move because the telescope is tracking the fast-moving 2005 YU55. The huge asteroid 2005 YU55 was small and dim in the sky during its close Earth approach yesterday (Nov. 8), but a handful of high-school students helped it blaze bright on computer screens around the world. The Clay Center Observatory in Brookline, Mass., tracked 2005 YU55 with its 25-inch (64-centimeter) telescope as the big space rock flew by Earth Tuesday evening, then webcast the resulting images live around the world. And three high school kids from Brookline's Dexter School were in charge of making it happen. "We're running the telescope and viewing and taking pictures of the asteroid," junior Sam Lapides told SPACE.com on Tuesday. "There are some advisers who are helping us if we run into any problems. But overall, it is student-based and student-run." Though there was never a chance the asteroid would strike our planet, the flyby was still historic. Such a big space rock hasn't come so near to Earth since 1976 and won't again until 2028, researchers said. Astronomers around the world trained a suite of instruments on 2005 YU55, eager to learn as much as possible about the space rock before it receded once again into the depths of space. Those instruments included the huge radio telescopes at the Arecibo observatory in Puerto Rico and NASA's Deep Space Network facility in Goldstone, Calif. — and the Clay Center Observatory's 25-inch scope. 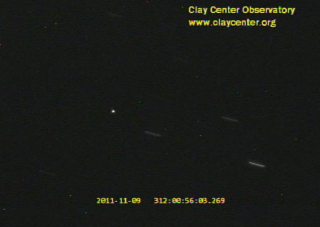 The Clay Center's live video feed brought 2005 YU55 down to Earth for thousands of armchair astronomers, showing the space rock as a bright white dot. Stars appeared to streak past it, a result of the telescope locking onto and following the fast-moving asteroid. The private, K-12 Dexter and Southfield Schools (Dexter is for boys and Southfield for girls) run the Clay Center Observatory. 2005 YU55's close approach provided a dual opportunity to do public outreach and give astronomy-minded students some real-world experience, school officials said. Dexter freshman Nick Weber was in charge of tracking the asteroid, with help from fellow freshman Nick Veo and Lapides. Faculty advisers were on hand to guide them and lend a hand in case any difficulties cropped up, the students said. In addition to airing the webcast, the observatory also opened its doors to the public, welcoming several hundred people over the course of the night, according to school officials. Weber said he hoped everybody who stopped by in person or on the Web got something out of the experience. "I hope they get that astronomy and science is really cool, and it can be done even just a few miles outside of Boston," he told SPACE.com. "You can do astronomy anywhere, as long as you have an interest." "I think it's great," Veo told SPACE.com. "It's just more people that we get to share our information with, and they get to experience it along with us." And the project certainly reached a lot of people. By 10 p.m. EST Tuesday night (0300 GMT Wednesday), more than 61,000 people had tuned in to the observatory's webcast, according to the counter on the video feed.